Liberty is a suburb of Kansas City and has a population of around 30,000 residents. It is located in Clay county and is also the county seat. Liberty is also part of the Kansas City Metropolitan Area and is home to the William Jewell College. For those who reside in the area, KC Pro proudly does foundation repair and the surrounding area to ensure a safe living environment. The city of Liberty was settled in 1822 and shortly after that it was named the county seat. Several years after a man named David Rice Atchison established a law office in Liberty. He was joined by a colleague, Alexander Doniphan, a few years later. They mainly argued cases defending the rights of Mormon settlers, served Northwest Missouri in Missouri’s General Assembly, and labored for the addition of the Platte Purchase to Missouri’s boundaries. Eventually Atchison’s colleague moved on while he stayed and helped the town further progress. 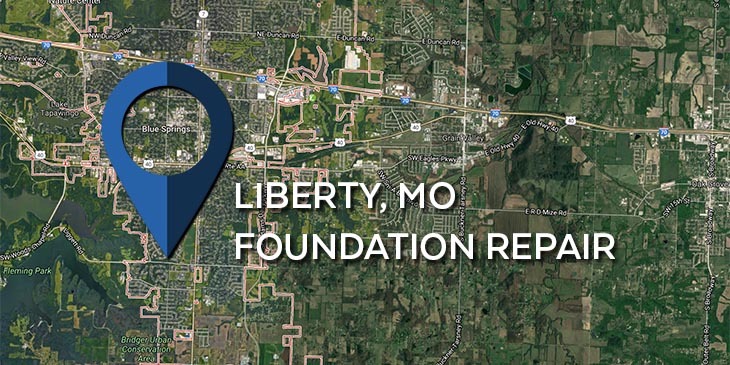 KC Pro proudly provides foundation repair Liberty MO and for the surrounding areas for your home. If you find that your home is having foundation problems such as cracks, leaning walls or chimneys, or a sinking foundation, then you need to have a professional take care of the issue. K.C. Pro can solve your foundation issues, so that your home can continue being safe and sound for everyone. Soil-related disturbances tend to be a large factor when needing foundation repair. Poor compaction, overloading, and excessive materials that expand and shrink with the changes in the moisture content greatly impact the amount of stress on your home’s foundation. We can relieve the amount of stress on your home through use of helical and steel piers and the procedure of underpinning. Our trained experts will drive these piers deep into the soil below your home until they reach the stable footing of bedrock. From there we will attach the opposing end to you homes foundation, essentially, holding it up. This is called underpinning and it is a great way to relieve stress that might cause foundation cracks and failure. Unfortunately, foundation damage and water seepage often come hand in hand. When there are cracks in your home’s foundation moisture will easily be able to find it’s way into your home. This could result in mold growth, wood rot, and damaged belongings. Protect your home with the most reliable company around. KC Pro offers you basement waterproofing services. We want your home to be safe and sturdy, so if you are dealing with waterproofing problems we can help. The products and services we provide include interior and exterior waterproofing systems, sump pumps, and crawl space encapsulation. We will keep your basement dry, preventing mold, foundation damage, and loss of belongings. Our variety of basement waterproofing services can help you out in many ways. Have us come in and check it out so we can tackle the waterproofing issue as soon as possible. If you are in need of foundation repair or in any of the surrounding areas, then call the experts today at KC Pro.